Shames and Shirin have been living in Chamesko camp, Northern Iraq, for four years. They are part of the Yezidi community who were forced to flee the atrocities perpetrated by ISIS (Islamic State of Iraq and the Levant/ al-Sham) in 2014. Shames recounts, “My husband and I were captured by members of ISIS when they stormed our village [in Sinjar, Northern Iraq]. We were lucky enough that their car broke down and saw this as a chance to escape while they were repairing it. Our children were able to escape before ISIS captured the village. Today, most of them live in Germany and I hope that we can join them in the near future. There is nothing left in our village; our house [like many others] is completely destroyed”. When asked if she plans to return home, Shames replies “Of course, I wish I could return to my village someday, but only if it is safe, if my home is rehabilitated and if we receive financial assistance to help us rebuild our lives, but those conditions are far from being met right now”. In Chamesko camp, Shames lives in a tent near her former neighbors, and when they meet, they cannot help but remember the terror they witnessed first-hand. Perhaps it is only by sharing with each other that they are able to find solace and the strength to carry-on, knowing that only they can truly understand the depth of each other’s sufferings, or perhaps by seeing each other every day they are inevitably reminded of the life they once had and the remnants of those lives now. ‘We cannot return because we simply have nothing left”, Shirin adds. 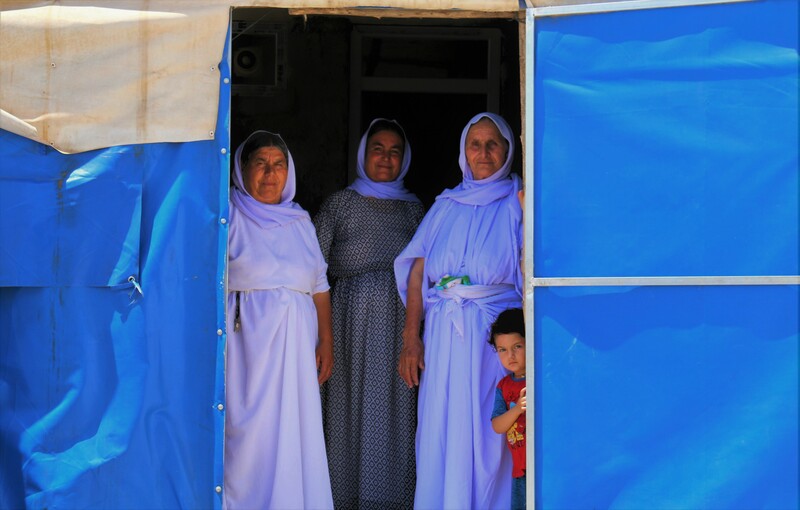 “My family and I fled the day before ISIS came to our village. We had no other choice but to remain in hiding for ten days in the mountains, without food supplies and other necessities. My husband had to carry my son all the way, as he is disabled and cannot walk. It was a very difficult journey and what we witnessed along the way left us emotionally drained. We saw many dead children, whose mothers were forced to leave them behind. We will never forget what has happened to us and so many others like us”. She continues, “Today, we live in this camp, but our living conditions are very harsh. We only have two hours of electricity per day, from 12pm to 2pm, and five hours in the evening. We sleep in the afternoon because of the excessively high temperatures during the day (reaching over 40 degrees Celsius in June, July and August)”. Such high temperatures often cause dehydration, which in turn leads to general fatigue.